Arenzville (population 419) is located in western Illinois about 12 miles northwest of Jacksonville. The town was platted in 1839 by its founder, Francis Arenz. Arenzville sits quietly on Arenzville Road at Virginia Road in the southwestern area of Cass County. The At & St Railroad travels through town. A branch of the Indian Creek flows through Arenzville as well. The village was organized as an official town in 1853. Some EXCELLENT reading regarding Arenzville and its storied history can be found at the following web address: http://www.burgoo.org/schools/schools.html. Great work by site creator Molly Daniel!! The school system was initiated shortly after the towns' establishment. A nice history of the school system in Arenzville is available at the web address of http://www.burgoo.org/people/zusckha.html . The grounds on which the Arenzville schools have stood was originally donated to the town for this purpose by a man named John Zuschka who passed away in 1843. 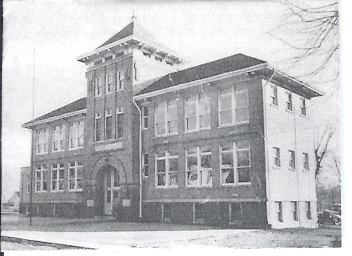 The first substantial brick school building was constructed on this property and opened for classes in 1892. It was referred to as the "Zuschka School." This school operated as a 1 - 8 grade school with a 2-year high school. Unfortunately this building was burnt to the ground in a fire in 1908. The townspeople of Arenzville did not hesitate after the fire demolished the first building. Construction on a new building was begun almost immediately. 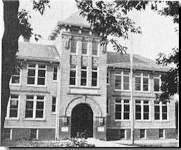 The new building opened for class in 1909. This building served the town well for six decades, holding high school classes from 1909-1959 and continuing to hold grade school classes from 1959 - 1969. It was in the late 1950s that consolidation talks arose between the school districts of Arenzville and the nearby towns of Concord and Chapin. 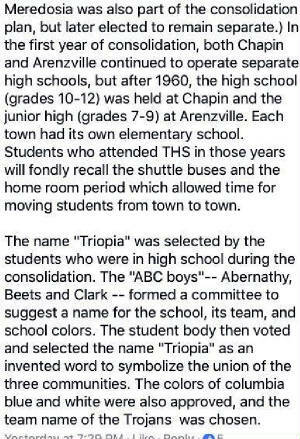 The effort became a reality after the 1959 school year with the creation of the Triopia School District. 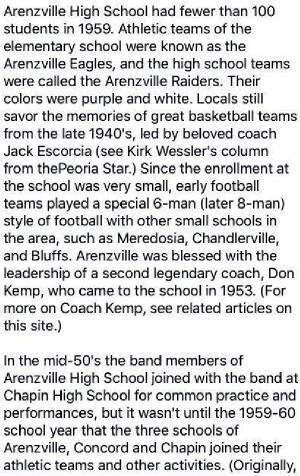 For more information on the Arenzville High School history and Mr. Zuschka please check out the following web links provided by Jacob Surratt. 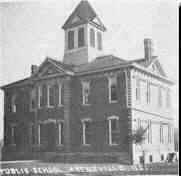 The following brief history of the merger of Arenzville, Concord, and Chapin school districts was located on Facebook, written by Mark Phillips, and submitted by Joe Dewees. Written by Mark Phillips, submitted by Joe Dewees. Written by Mark Phillips, and submitted by Joe Dewees. The high school for the new district is located in the tiny hamlet of Concord. The Arenzville High School building was phased out 1969 and no longer used as a school. This school building has since been demolished..
Arenzville HS team nickname: the "Raiders"
Arenzville High School's Raiders competed in boys basketball for sure. As with most of the smaller schools on this site we believe that AHS offered baseball and track as well. School team colors, fight song, team records, and coach's names are all being sought at this time. After the 1959 consolidation of Arenzeville with the districts in Concord and Chapin to form Concord Triopia, the sports teams competed under the Triopia banner that first year. However the students attended school in their old buildings until the new Triopia building was ready in 1960. Coach Don Kemp became the head football coach at Triopia and went on to a long and distinguished career coaching football at that school. He got his start at Arenzeville. Boys basketball at Arenzville High School is the only sport covered on the IHSA website (www.ihsa.org). The Raiders had some real nice seasons including four District Championships and one UNDEFEATED regular season!! A great article on the first two District Championship seasons can be viewed at http://www.burgoo.org/stories/basketball.html. The best of the Raider seasons as listed on the IHSA website are in turn listed below. As you can see, Coach Don Kemp did a real nice job guiding the program through its later years. Scores invoving Arenzville High School boys basketball teams playing in the IHSA state tournament are located on a website title "Illinois Postseason High School Basketball Scores." *All IHSA Postseason scores, season records, and coaches' names for seasons prior to 1940-41 are needed. ROUTT (54): Hanley 18, Bonjean 15, McGrath 9, Gruber 6, Lonergan 3, O’Connell 2, Spreen 1. ARENZVILLE (37): Lovekamp 12, Wessler 11, Jones 6, Roegge 6, Beets 2. RUSHVILLE (70): Wherley 23, Stevens 18, DeMoss 16, Little 9, Milby 3, Gillenwater 1. ARENZVILLE (47): Janssen 10, West 9, Schnitker 8, McCloud 7, Allen 4, Crawford 3, Zulauf 2, Caris 2, Hobrock 2. *Last boys basketball game for Arenzville High School. NICE JOB ARENZVILLE HS RAIDERS! !